Semi Matalau never dreamt that one day he would end up in a prison cell. He was once a celebrated civil servant, revered mentor and lay preacher in his community who one day found himself on the wrong side of the law. Today, Mr Matalau works on his family farm, supplying dalo and cassava to the market and also runs a cattle farm. But his biggest achievement to date is the setting up of a sub-division for 50 residential lots from within the walls of the Naboro Prison while he served his sentence in 2014. These residential lots, which belong to his land owning unit from his village of Natogadravu in Tailevu, was developed over the last three years and was commissioned recently in August by the Prime Minister, Voreqe Bainimarama. “It took us three years to develop it with slightly over just $1M spent on total development, government assisted with $437,400 in the form of payment of an FDB loan,’’ Mr Matalau said. The will and determination to set this in motion began from inside the prison walls of Naboro, which Mr Matalau said, was a great testament to the rehabilitation process and leadership in the Fiji Corrections Services. “This is my story, and I want to preach it to the whole of Fiji – that no matter how low you go in life, God always has a purpose for you only if you accept the circumstances and have the will to rise,” he said. “I was committed into the Labasa Corrections Center for 3 years from May 2011,’’ he said. Mr Matalau was engaged as a Deputy Supervisor of Elections when he was charged with abuse of office while working in the divisional office in Labasa. “I did a lot of soul searching, I demanded answers from God whilst lying down in the darkness of my cell in Labasa Corrections Center,’’ Mr Matalau recalls. He said through the power of prayer, it was revealed to him that he had a greater purpose and that being in prison was his first test. So he began the next day accepting the sudden change in his life as God’s will. “So I enjoyed every single day in Prison come rain or shine, whether I was outside in the farms or inside within the confines of the walls because I had accepted my circumstances. 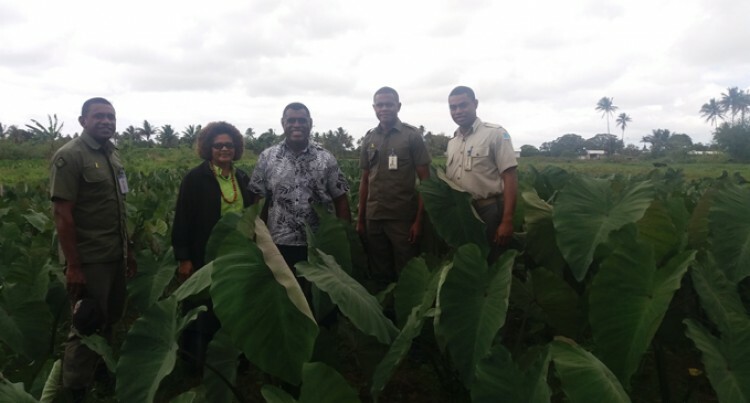 Within the first few months in Labasa, Mr Matalau helped engage the Ministry of Agriculture to partner with Fiji Corrections Services to set up a rice farm to ensure food security for the centre. Mr Matalau didn’t get to taste his first rice harvest in Labasa as the Commissioner of Corrections arranged for his transfer to Naboro Minimum Facility to assist the Small Business Units (SBUs). Through this support of the FCS, Mr Matalau was able to realise his dream for his family and village sub-unit (Mataqali) with the set up of their new sub-division business. “It was with the support and vision of the Commissioner of Corrections that I was able to set up a meeting with my land development partners from Australia in Naboro in 2013, I was also blessed with the provision of a full time project manager and accountant after this meeting. “By 2015 we were approved a Bank loan from FDB, the authorities and Government was now supporting our project too. Yellow Ribbon Programme director Elenani Vuru said the first stage in rehabilitation was always accepting that you have been incarcerated. “Mr Matawalu was exceptional not only because he had a lot of experience from the civil service but also because from day one he had vowed to use his term in prison to learn and work hard to help others,’’ Mr Vuru said. Through Care encompasses the holistic spectrum of effective rehabilitation and this core business of the FCS demands an intergrated strategy of all arms of our community, stakeholders, family government and Corrections to ensure its success. Living in the outside world is much tougher, according to Mr Matalau. “Because society sets a certain standard which hinders the efforts of former offenders to regain their lives,” he said. “Some communities and families are great because they accept back their loved ones, others are not so fortunate. “This is what we call the second prison when we get out of jail, so for us it takes a lot of courage and spiritual strength to sail through this second prison. Mr Matawalu says his short journey taught him a lot and also made him re-look at existing rituals in the church and vanua which was counterproductive to building a family. “I saw disobedience, hatred, jealousy, malice and wilful indulgence in petty ill feelings when I first arrived back into society. There was no prosperity in families, villages, churches and so forth. People have become a menace to other people,” he said. “On my return I tried to re-establish myself back in the Vanua through the land project, but most importantly was my family who I was grossly indebted too and had remained intact through the grace of God during my absence. Mr Matalau is currently a member of the Tailevu Provincial Council, the Eastern Division Crime Prevention Board while also being the Managing Director of their Land Development Company. “To unlock this second prison requires a lot of courage, and will power because it is not easy. We must always surround ourselves with strong and positive people to keep us focused,” he said. “I commend the work done by the Yellow Ribbon Programme, for that to work we ourselves must unlock our second prison – through guts, determination and faith, never lose sight of the fact that our lives are what we make of it.